Ever start chopping onions or slicing meat only to find the knife might be better suited for cutting butter? 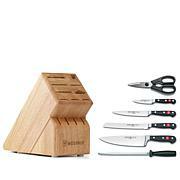 This handy set of nonstick knives comes with corresponding protective sheaths that feature built-in ceramic sharpeners to help you get the job done. Now, that's one sharp idea! Love the covers for these knifes. As I am a bit of a klutz. Very sharp and stable. 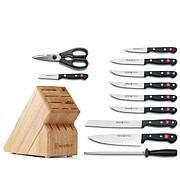 These are excellent knives and so much easier to cut with. Keep them in the sheath when not in use. They are very sharp and so everyone should be cautious when opening them. I cut my finger quite deep when opening the package. They are well worth the money, because the fish I cut was just like cutting through butter. It was never never that easy with any other knife. Goes right through stakes like butter too.